Once you have received your official grade report, you may request an official transcript from one of our academic partners, please click on the link or see the information listed below. Office of the Registrar, Seattle University, 900 Broadway, Seattle, WA 98122. University of Rio Grande (pdf) The University of Rio Grande will automatically mail the student a grade report. If a transcript is needed the transcript request form can be faxed to Records at 740-245-7445 or mailed to: Records Department – University of Rio Grande, PO Box 500, Rio Grande, OH 45674. There are no charges for the transcript as the workshop was taken through Educational Resources, but the form does need to be completed and sent to the University of Rio Grande – Records Dept in order to receive a transcript. What if I need to cancel my course registration? On-Site Courses: You may withdraw at any time. Students should be aware that there is a $70 non-refundable cancellation fee. Independent Study/Video Courses: You may withdraw at any time. Students wishing to withdraw from a course are required to return all course materials. Students should be aware that there is a $70 non-refundable cancellation fee. Will these classes earn any Graduate Level credits? Yes, our courses offer either 2 or 3 semester hours of graduate level credits through our academic partners, Morningside College, Augustana University, or University of Rio Grande. Can credits earned from your courses be used for either continuing education credits towards relicensure or towards a lane change (salary advancement) in my school district? Credits earned from taking these courses meet the requirements for license renewal or salary advancement when prior approval has been obtained by your state, district or employment personnel office. 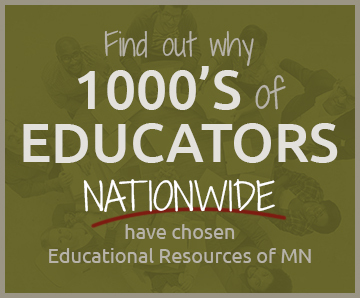 Educational Resources encourages you to refer to your state and local guidelines. If you need more detailed information about the course, please contact us. If my school district would like more information about the course(s), what should I do? Please contact us via email or give us a call at 800-278-8126 and we will send you a course syllabus and outline to present to the district office. Will these classes be accepted for my graduate program? Any student seeking to transfer graduate credits into a graduate program at another institution is advised to obtain prior approval from the academic advisor and the dean at that institution. If you need more information from us, please contact us. What if I need proof that I have taken a class for relicensure? Every student will receive a receipt for the class they have taken stating how many credit hours it was worth. Furthermore, after you have completed the class, you will receive a grade report after which you may request a transcript from the college showing the credits you have earned. How often do you offer your courses? Our Video and Independent Study courses are offered year round. On-Site courses are offered in certain states throughout the summer. Can classes be taken in any order? Yes, they can be taken in any order; it does not matter which class you take first. What do video courses entail? Video courses are an affordable and flexible way to earn graduate level continuing education credit. Our educational video courses, designed for the professional development of educators, consist of professionally produced DVDs and corresponding text lessons. There are no final exams; instead you will be asked to write an Action Plan on how you can incorporate the information you learned from the class into your own teaching or leadership position. Many come away refreshed from the easy to implement, inspirational, and effective teaching strategies presented. You have up to 4 months to complete a course. Are there any online requirements? No, all of the course content will be mailed to you. What does an independent study course entail? These text-based, independent study courses are great for the teacher on the go. An independent study course consists of one book along with corresponding lessons. After you have read the book and completed all of the educational lessons, you will be asked to write an Action Plan on how you can incorporate the information you learned from the class into your own teaching or leadership position. Students enjoy the flexibility of an independent study course and find it easy to fit into a busy schedule. The book is yours to keep once you are finished with the class! When will I know if a course has reached minimum enrollment? As soon as we reach the minimum of 10 participants, we will send you a confirmation notice with the exact location of the class. If you are sure you are going to take a class, we encourage you to register early. Class times may vary from state to state. Please check the registration form for your specific state. How can I become a class Instructor? If you are interested in teaching any of our On-site courses, please contact us at 800-278-8126 to discuss employment opportunities.